Proper digestion is MUCH MORE than the absence of gas, bloating, heartburn or constipation. Great digestion pays dividends in more energy, a brighter mood, sharper brain function, better skin and so on. 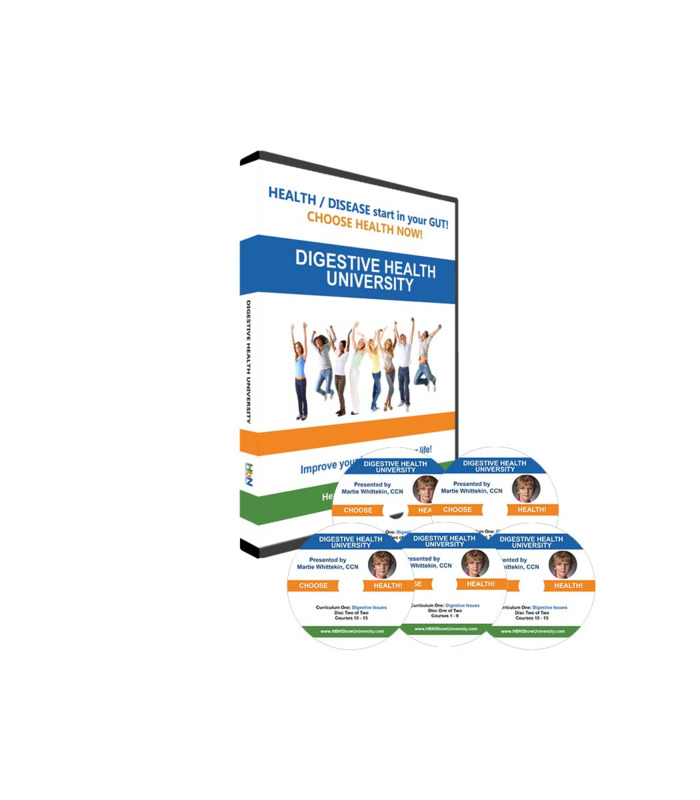 Let the HBN University Digestive Wellness Curriculum teach you crucial reasons to optimize digestion, build a strong intestinal barrier, boost good bacteria, and effectively detoxify. Find the root causes of health problems and fix them! In the 4th Century BC, Hippocrates, the father of medicine, said “All disease begins in the gut.” Scientific research is finally proving how right he was. Don’t wait decades more for that knowledge to reach mainstream medical practice. Take charge of your health today! Heartburn / Acid Reflux: The popular drugs for these conditions, if used for more than a few weeks, can create life-threatening side effects. Solve the indigestion problems naturally and comfortably wean off the medications. Constipation: You might be constipated, but not realize it. Become regular naturally. Do you know if toxins in your cells are silently taking a toll on your health, happiness and longevity? If you know the methods, beneficial bacteria in your gut can be harnessed to reduce toxins, improve vitality and protect you from disease. Toxins: Chemicals in the air, food and water can damage your thyroid gland, brain, heart, fertility, and, well, every cell and system in your body. Learn how to avoid them. Detoxification: Learn about proven detoxification techniques, equipment (e.g. far infrared sauna) and supplements. Probiotics: The trillions of friendly bacteria in your digestive system are as important to your well-being as your liver, kidneys and genes. For instance, they help immune function, make nutrients and detoxify. This course tells how to feed them and protect them from harm. It also provides guidelines for selecting probiotic supplements. Includes natural remedies for vaginal yeast infections, athlete’s foot / smelly feet, and nail fungus. A Certified Clinical Nutritionist for decades, Martie has studied with some of the brightest minds in the natural health field. She is the best-selling author of two books on digestion, Natural Alternatives to Nexium and other Acid Blockers and The Probiotic Cure. MS Whittekin has hosted the syndicated radio show, Healthy by Nature, since it began in 1997. Martie believes we should be naturally healthy and active until quite late in life. For example, her vision for other seniors is illustrated by photos on the bio page of her program’s website. They show her on a Texas Longhorn, holding a giant python, zip lining through the jungle in Costa Rica and enjoying indoor sky diving. Course 5 - What is Constipation?